Finals week can be stressful time of the year. Researchers have found that meditation can have many health benefits including increasing academic performance¹ and reducing stress levels². 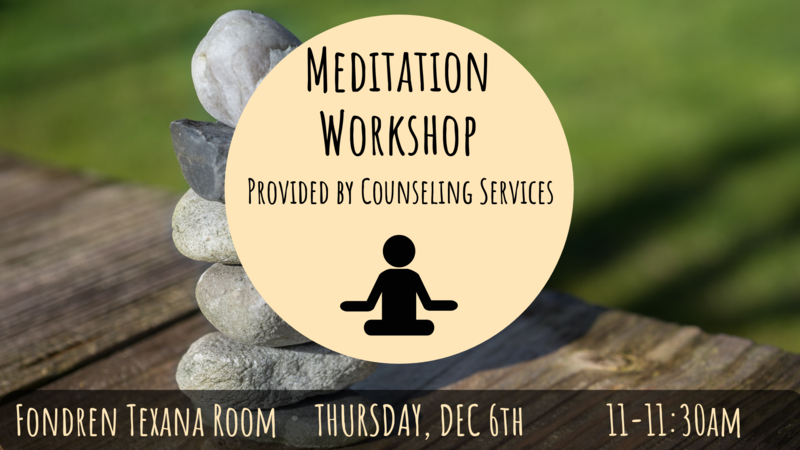 Join Dr. Juli Hobdy from the SMU Counseling Services for a meditation workshop to help you learn techniques for increasing focus and reducing stress. 1. Helber, C., Zook, N., and Immergut, M. (2012). Meditation in Higher Education: Does it Enhance Cognition? Innovative Higher Education, 37(5), 349-358. 2. Singh, Y., Sharma, R., & Talwar, A. (2012). Immediate and Longterm Effects of Meditation on Acute Stress Reactivity, Cognitive Functions, and Intelligence. Alternative Therapies In Health & Medicine, 18(6), 46-53.